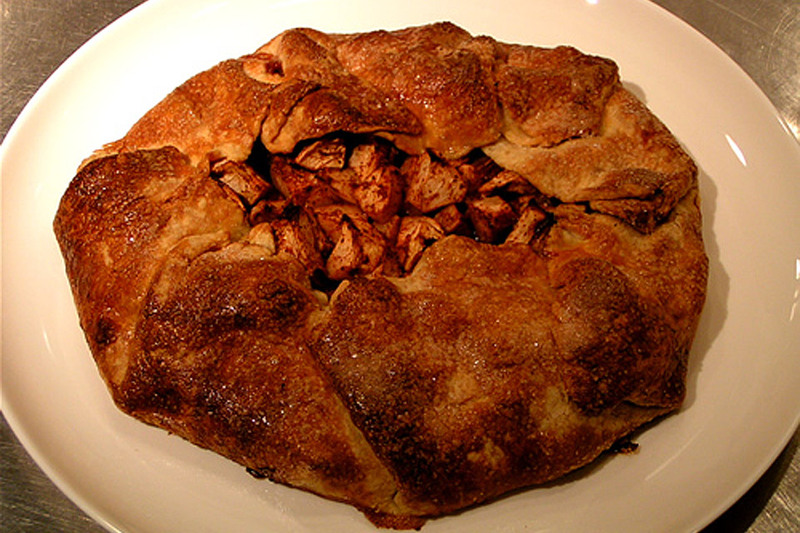 Apple Galette is a simple recipe that can be used whenever you find you have too many apples, berries, plums or almost any fruits. Another aspect is that you don’t have to have any particular pie form, a simple baking tray lined with parchment is enough. Perfect for the summer house where baking equipment is always at a minimum. whats on hand. You can even make vegetable galettes filled with vegetables and cheese for lunches, brunches or light dinners. You will need the recipe for Pate Brisée. 4 Medium Granny Smith apples peeled, cored and cut in to 1cm cubes. juice of one lemon 1/2 for the pie and 1/2 for the water. Preheat oven to 180°C or 375°F. Prepare Pate Brisée, and let rest for one hour in the fridge. In a bowl large enough to hold the cut up apples, fill it with cold water and put in the juice of half a lemon. Peel, core and cut up the apples and place in the the water to stop them from going brown. Strain all the apples and return to them to the bowl. Add the white sugar, cinnamon, ground clove, lemon zest and lemon juice. Toss well to combine everything together. Set aside while you roll out the dough. Roll out the pie dough to 3 millimeters thick, in a large circle. The shape of it is not so important. This is supposed to be a rustic looking tart. Take the bread crumbs and sprinkle them evenly around the middle of the galette. 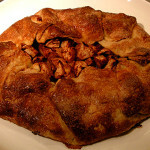 Then take all the apples and arrange them in the center of the dough leaving a border of about 3 cm or dough uncovered. Save any liquid in the bowl. Take the extra dough that you left uncovered and fold it up over the apples pinching it a bit so that it holds it's shape. Remember it's suppose to look rustic and homemade. Brush the boarder with the egg wash and sprinkle it with the raw sugar. Now take the leftover liquid and pour it evenly around the apples and then place in the oven and bake for appox. 50 minutes. When done, remove from the oven and let cool. To finish heat the apricot jam and brush it over the apples to give them a nice shiny glaze. Serve with cold whipped cream, vanilla ice cream or vanilla sauce. This is a simple recipe that can be used whenever you find you have too many apples, berries, plums or almost any fruits. You don't have to have any particular pie form, a simple baking tray lined with parchment is enough. Perfect for the summer house where baking equipment is always at a minimum. A Galette can be any shape or size, it all depends on how much fruit or pie dough you have on hand. There are no rules, its all about using whats on hand. You can even make vegetable galettes filled with vegetables and cheese for lunches, brunches or light dinners.